Youngzine is a wholesome, unbiased and engaging media platform where children learn about news and current events shaping our world. Youngzine is not just another news website for kids - our age-appropriate articles explore the context behind the news stories, spark curiosity and critical thought, and develop an openness for perspectives and cultures different from their own, in young minds. Our goal is to help parents and educators create a vibrant community of well-informed and engaged young citizens in an increasingly connected world. 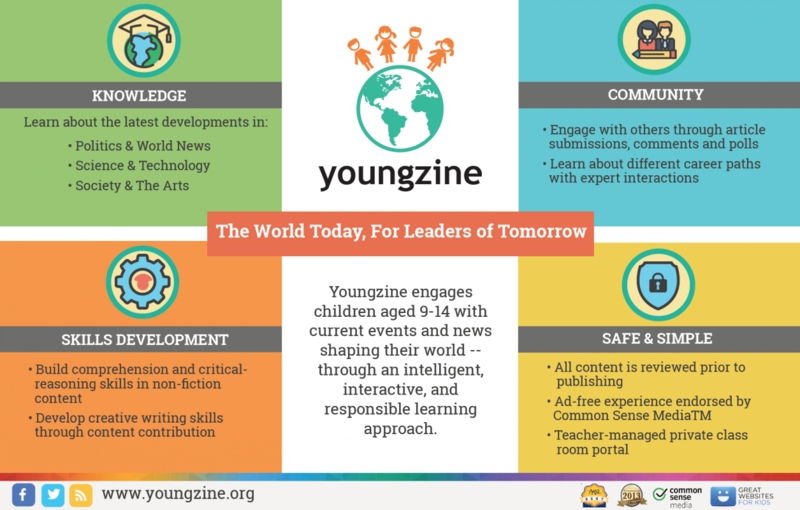 Besides news stories, Youngzine provides a platform for children to have their creative writing published and a private classroom portal for teachers to create and manage classroom assignments. Sign up your child or classroom for free! "Youngzine's mission is to bridge the gap between the classroom and the real world by providing a platform for young people to learn, explore and discover their role as global citizens." "We envision a generation of empathetic, globally aware, and empowered youth who are actively engaged in the world"
"The World Today, for Leaders of Tomorrow"